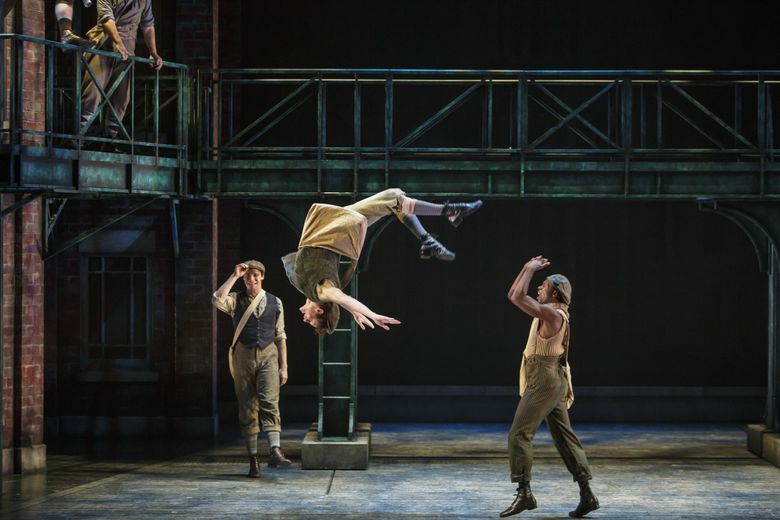 The Issaquah production of “Newsies” is loaded with the heart and wit of the original 2012 Broadway hit, but the greatest attraction is its dance sequences, with more than a dozen dancers delivering handsprings, tumbles, ballet turns and tap moves. It’s not quite the last hurrah for Steve Tomkins, Village Theatre’s retiring artistic director, but his production of “Newsies” is a fitting summation of his estimable skills as a director. 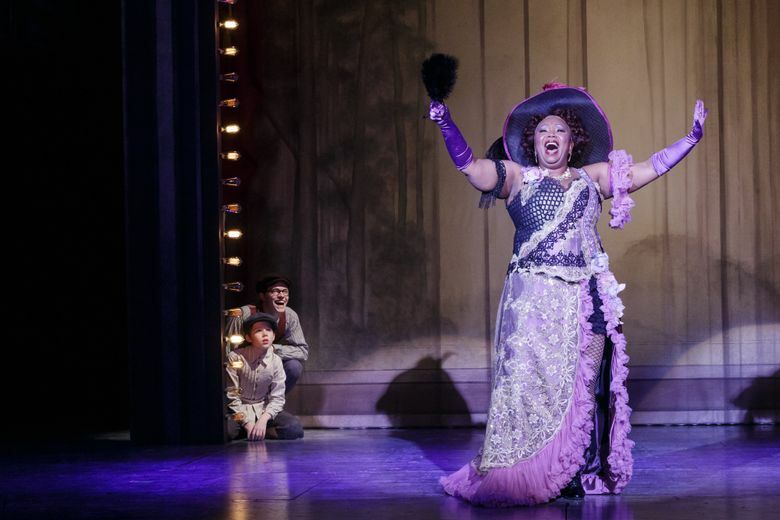 The penultimate show he’ll helm as the theater’s artistic leader (“Hairspray,” in May, will be his last), “Newsies” is a lean, energetic, crowd-pleasing machine, and Tomkins coaxes every last bit of joy from the show’s marrow. Every witty rejoinder pops. Each pirouette and high kick lands with precision. Even the very pro forma romance swells with feeling. Tomkins will be missed. Incoming artistic director Jerry Dixon has some intriguing ideas about a new direction for Village, and his desire to produce more modern plays and new musicals should enliven the theater’s programming. But if bringing Tomkins back to guest direct isn’t part of his plans, I hope he’ll reconsider. by Alan Menken, Jack Feldman and Harvey Fierstein. Through Sunday, Dec. 31, Francis J. Gaudette Theatre, 303 Front St. N., Issaquah; $40-$77 (425-392-2202 or villagetheatre.org); and Jan. 5-28, Everett Performing Arts Center, 2710 Wetmore Ave., Everett (425-257-8600 or villagetheatre.org). “Newsies,” a 2012 Broadway hit based on the cult 1992 film, has a score from Alan Menken that just keeps soaring, from declarations of longing to resolutions of protest, and a snappy book from Harvey Fierstein. 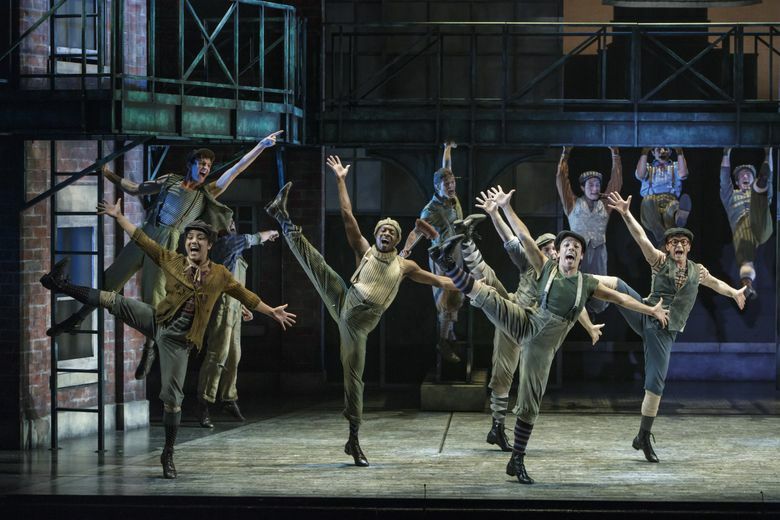 But the show’s real attraction is its dance sequences — wall-to-wall numbers that capture the newsboys’ unified front in a flurry of handsprings and tumbles, ballet turns and tap moves. Katy Tabb’s choreography, faithful to the original, is executed with tossed-off flair by an ensemble of more than a dozen dancers. Based on real events in 1899 New York when young newsboys protested against unfair wages, “Newsies” is backed with a social conscience beyond the typical Disney platitudes about love and family — though those aren’t missing. Simplified it may be, but the show’s depiction of an organized-labor group standing up for its rights is genuinely stirring. That occurs under the leadership of Jack (Joey Barreiro), a newsboy for the New York World and de facto father figure for a ragtag group of mostly orphaned boys who scrape out a living selling “papes.” Barreiro, who starred as Jack in the first national tour, exudes surplus charisma and has a tenor to match. The boys’ ultimate adversary is Joseph Pulitzer (a gleefully amoral Greg Stone), the World’s publisher who decides to extract additional financial value from the lowest rung of his distribution ladder. Any shortcomings in the plotting are easy to accept because we’re never far from the next rousing dance routine. The ensemble slides around on torn-apart newsprint or executes a series of perfectly in-sync leaps or tussles in a street brawl that’s at once violent and graceful. The show’s physicality is ecstatic — and so are we.